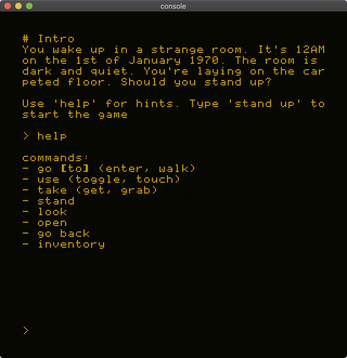 Alive is a text adventure that explores loneliness. Type "help" for hints! So there are many functional things wrong with this game that could be easily fixed if you play text-based adventures often. The first thing is a simple directional-based movement alternative. I was located in "Master Bedroom" and typing "go east" to go back to the Dark Corridor would not work. I had to write down room names to navigate, which really gets me out of the game. Another thing I noticed is interacting with some objects takes you to a "separate" screen that you have to type "go back" to get out of. For example, examining the bedside table in the Master Bedroom takes you to a completely different screen, in which you cannot say "Go to dark corridor". You have to type "go back" then "go dark corridor". Some interactions just say "Nah, can't do that" and like? No reason whatsoever why it shouldn't. "Turn off bathtub taps"; nah. Alright, "turn off taps", nope. "Use taps" nada. Why can't I? It would be useful to have "That's not important" or even "I can't waste my time on things like that." I like the POV though. Where am I, who am I, who's family home is this, that sort of thing. It's a nice case to solve! I really enjoyed it, but I'm sure I missed a lot of it! When I went to the children's room, it wouldn't let me leave or look at the doll's house? Mmmh, never seen that one before. What happens exactly (what does the game say when you type 'stand up' ? Oooh, it's beautiful, what engine did you use? And which font is that, it reads so nicely! I like the vibe but I couldn't progress at all due to the inability to look around the room again., and after trying just a few options the initial description was long gone. There were a lot of classic IF commands which just didn't work as well. I think either using a parser like Inform which comes pre-baked with most classic IF verb conventions, or using a Twine style system of branching options would work. Look forward to playing some more! EDIT: I tried playing it a little bit more and immediately an example of what I'm talking about leaps out. You've established rooms and exits in cardinal directions, but when I type "go north" the game literally says nah. I have to type "go to the dining room" to do so. I don't mean to sound rude, but this doesn't feel like good game design. If you don't want me to "go north" why tell me the room is north, other than for mapping purposes? 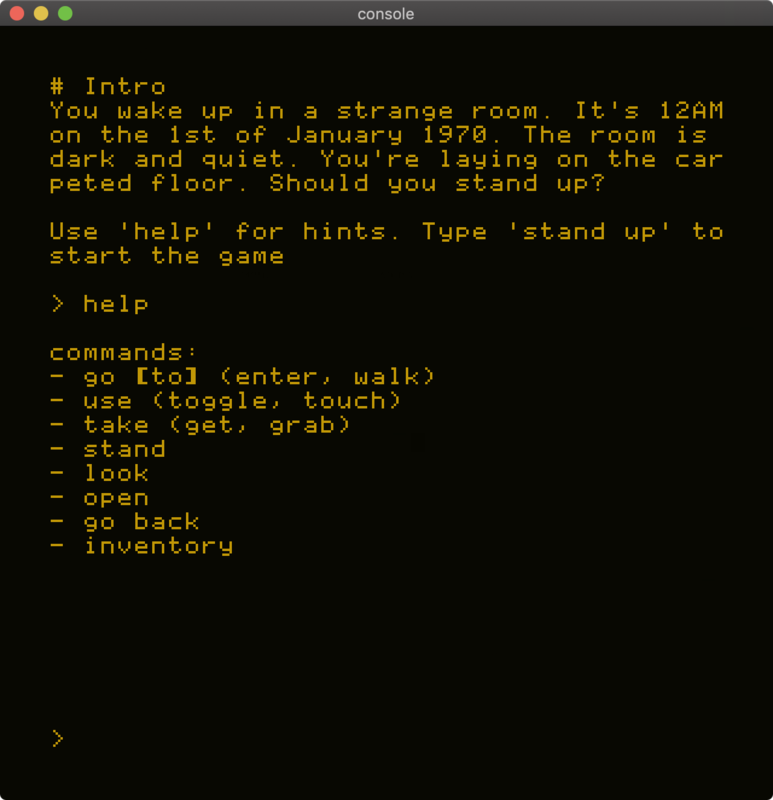 Also text parsers are hard, so encouraging short commands like "go north" or "examine coats" is a lot less frustrating to players and designers in the long run, because if you have to say "go the the dining room" you are teaching the player that more verbose phrases are required and they will start adding in unaccounted for words which won't work and will frustrate the player. Hiya! Thank you for the feedback :) This was done very quickly over Global Game Jams, and one of my goals was learning how to write parsers. The things you've mentioned are definitely sticking point for us too, and that's being working on just now! Wary of giving a timeline just now but we've got a much more stable and flexible build in the works, it'll be pushed here when it's ready. I hope this helps!